In literature and art, those whose names are not known are often called Anonymous, meaning “nameless” or “unnamed”. To Hungarians, the name Anonymus – with latin spelling – belongs to the most important chronicler of the Hungarian king, – probably Béla III. He never signed his writings, only as P. dictus magister (“Master P.”). He lived in the 12th-13th century, some identify him as Péter, the bishop of Győr. Statue of Anonymus in the Vajdahunyad Castle. His most famous work, the national epic, is called the Gesta Hungarorum (“The deeds of the Hungarians”), written in Latin, chronicles the ancient history of the Hungarians and their journey from Scythia to the founding of Hungary in the Carpathian Basin by St. Stephen. The only copy of this 13th century book – though not original – is found in the National Széchenyi Library in Budapest and dates from around 1200. The authenticity of his stories are questioned by modern historians, some contradicts other, more reliable historical sources. Just like Geoffrey of Monmouth, the author of the Historia Regum Britanniae, what Anonymus lacked in knowledge of facts, made up for in anecdotes and fantasy. He made up heroes and leaders and named them after existing places and rivers, and made his fictional heroes fight fictional battles in Pannonia. Still, his work in one of the very few sources of ancient Hungarian history and mithology, and for that, it is invaluable. It contains the most detailed account on the conquest of Hungary, and our only source for the names of the leaders of the seven tribes – although those names are disputed by historians. 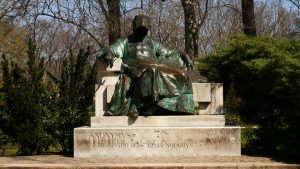 We don’t know much about Anonymus’ life, but it is possible that he was born somewhere in the Upper-Tisza region, and studied abroad, most likely in Western Europe, where he became acquainted with the genre of the gesta – the epic, medieval collection of stories written in latin. Anonymus starts his gesta by saying that at King Béla’s request he is comfirming that Hungarians are descendants of the Scythians – a group of Eurasian nomads who inhabited the western and central Eurasian steppes north and east of the Black Sea until the 1st century BC – thus establishing Hungarians as the conquerors of Darius the Great, Cyrus the Great and Alexander the Great. He then states that Attila the Hun was also of that tribe, and that Hungarians were named by western tribes, because of the seven leaders’ long stay at Hungvár, which is in modern day Ukraine, next to the Ung river. The Gesta also tells the story of Álmos, one of the leaders, son of Emese, the magic surrounding his birth, the Turul legend, and how he made his son Árpád the leader of the seven leaders, hence Árpád’s nickname, the Knight of Hungvár. Anonymus’ Gesta Hungarorum also gives precious information about the earliest Hungarian noble families. Interestingly, Hungarians have another gesta from the late 13th century , also written in latin by Simon Kézai, the Gesta Hunnorum et Hungarorum (“The deeds of the Huns and Hungarians”). That one details the Hun-Hungarian relations, and the legend of the miraculous hind. The statue of Anonymus made by Miklós Ligeti in 1902, is standing in the Vajdahunyad Castle in Budapest, near the Heroes’ square in the City Park. 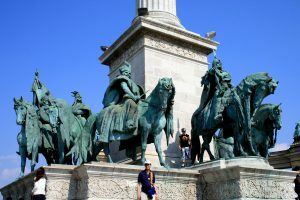 It was one of the ten statues gifted to Hungarians by Franz Joseph I of Austria. The faceless statue made by the 27 year old, relatively unknown scupltor was very controversial at first. So much so, that the committee ordered a second sculpture with a detailed face, but the first version with the hood throwing a shadow over the whole face became so popular, that the second version was broken on the spot and was replaced by the original. According to popular legend, rubbing his pen brings good luck an inspiration to authors, that is why that part of the sculpture is shinier that the rest of it. As a big fan of hidden history, ancient religions, myths and political intrigues, I always search for the astounding, the lesser known, the dark and bloody, and I don't rest until my curiousity is satisfied. I am an avid reader of classical and historical novels, vampire tales and science fiction, my main interest is the inner workings of the human soul and psyche.